The past two weeks have been busy ones in the crypto-world. In the preparation for the Bitcoin Gold Fork, BTC prices rose to all time new highs. Money flowed out of alt-coins and back into BTC to take advantage of the new Bitcoin Gold. We won’t get into BTG prices here, but it hasn’t fared so well thus far, falling over 62% in it’s first day of trading. We urge readers to keep in mind that ANOTHER hard fork is occurring mid-November, in case you didn’t know, so trade accordingly! In the meantime, let’s take a look at our weekly chart to see what our favorite coins have been up to. After touching that $6,200, ALL TIME HIGHS, we were watching closely for our sell signal and we got our confirmation by watching the RSI. The divergence of price making new highs and the RSI falling let us know that the rising trend was started to weaken. This has happened twice, signaling sell signals. Rising price on falling RSI is a strong sell indicator. After a buy at $5,580, a short-term sell signal was triggered again around $5818 after failing to bounce off trend line support. ETH, along with most alt-coins, fell leading up to the hard fork. The market wanted their BTC’s to get that Bitcoin Gold, supposedly anyway. Looking at all the alt-charts, every one of them shot up as soon as the hard fork ended. ETH is no different, although it appeared to be short lived. It’s currently trading in a channel consolidating, but it looks as though the short term downtrend is over for the moment. Again, like ETH and the other alt’s, we saw a little pop out of it’s downtrend but it was pretty minimal compared to some of the other alt-coins and the market didn’t seem inclined to jump back in here. Price is currently in a channel on low volume. As previously noted BCH has been in a solid several month down trend, although a bottom possibly has been found and we’ve seen a slight uptrend in the last few days. We’ve seen price touch around the $300-$310 mark several times, and some gains this past week working a slow uptrend. A buy signal from us was triggered around $318 based on past resistance, with price currently sitting at $350 area. 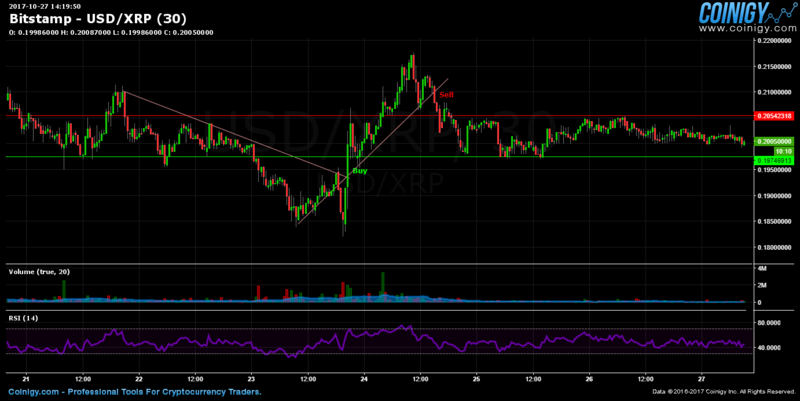 So far, price is respecting it’s trend and the chart looks healthy. We’ll be watching the uptrend for any short term sell signals. XRP too follows ETH and LTC. We saw strong selling leading up to the hard fork (which actually began after the lackluster Swell Conference) , a pop of about $.025 cents and now price has returned to consolidate in the $.20 area. A short term buy signal was triggered, as it was with all alt’s after the hard fork, but only for a quick scalp. Price is currently in a channel. The above references an opinion and is for information and educational purposes only. It is not intended to be investment advice.